Sony PHA-3AC review | What Hi-Fi? For a company with such a rich history in digital audio replay, we’re surprised it’s taken Sony so long to jump on to the desktop DAC bandwagon. The PHA-3AC is just the second such device we’ve seen from the company, and it’s more left field than we would have expected. This DAC is small: imagine something a little taller than a pack of cards, and at 230g, pretty light too. The inclusion of an on-board battery suggests true portability, but this doesn’t pan out in use. The battery is there to smooth the power feed to the audio circuits, but can’t power the PHA-3AC by itself. Disconnect the power input and the unit stops working. We tried to power the unit from our computer. It worked for a while and then shut down, so you’ll need the extra grunt of the supplied mains powered USB charger. The PHA-3AC has three USBs: a full-size connection for streaming music from iOS devices, a micro alternative to do the same from a computer or Xperia phone and a second micro just for power (5V DC). 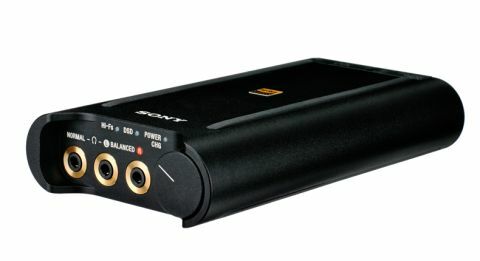 You can add optical to the list of inputs and a 3.5mm jack connection that can act as both input and output for an analogue signal. Look at the front panel and you’ll find three 3.5mm headphone outputs. One is a conventional stereo output, while the remaining pair is intended for ‘phones with balanced inputs – while Sony make a few compatible units, it’s an uncommon configuration. It’s also something we would have swapped for a dedicated 6.3mm output. We suspect anyone likely to spend this much money on a computer audio will have a serious pair of headphones. A lot of these still come with the larger jack input. Sure, adapters could be used but they’re not ideal. The PHA-3AC will cope with music streams up to 32-bit/384kHz, as well as DSD in both 64 and 128 forms. You have to use Sony’s ‘Hi-Res Audio Player’ software if you want to play DSD files. It’s available in both Mac and PC flavours. If you have a PC you’ll need dedicated driver software too. Once up and running, this Sony produces a pleasing sound. It’s fast, detailed and composed. We start off with our resident MacBook as source and are pleased with what we hear. A 320kbps version of alt-J’s Nara is as layered and organised as we hope for; the Sony doing a good job of rendering the song’s growing intensity. We try the PHA-3AC’s DSEE HX feature. It’s meant to improve the sound of lower bitrate recordings and it does just that, to a certain extent. The feature adds more high-frequency reach and makes the presentation notably more spacious. The effects are more pronounced the lower the bit rate, as a listen to a 192kbps file of Eminem’s Stan shows. There are small losses in rhythmic drive, though. Such source material isn’t a great test of dynamic ability so we move onto an old favourite in the form of Hans Zimmer’s The Battle from the Gladiator OST. Here, the Sony shows a lovely cohesion throughout the frequency range. The tonal balance is nicely even, with no part gaining undue attention. There’s plenty of agility too, and a pleasing sense of composure as the music builds relentlessly. Crescendos hit hard: there’s plenty of impact, yet at no point does the DAC tend towards undue aggression. We’re happy with detail levels too. Sure, the cheaper, but arguably less well-featured Audiolab M-DAC edges ahead in outright transparency and renders low-level nuances with more confidence. But, listen to this Sony on its own terms and it still pleases in these respects. A CD rip of Leonard Cohen’s Slow shows decent rhythmic integrity, as does Stevie Wonder’s Higher Ground on DSD. The PHA-3AC doesn’t overtly favour one file type over another. The differences are far more to do with the source material than it is the way this Sony DAC handles the file. Much the same goes for the DAC’s performance with phones. We tried it with an iPhone 5 as well as a Sony Xperia Z3 with fine results. In both cases the DAC showed greater control and subtlety than the phones’ output. The PHA-3AC is a fine performer. It has a pleasing blend of strengths, which make listening to all types of music a pleasure. If you’re in the market give this one a listen.